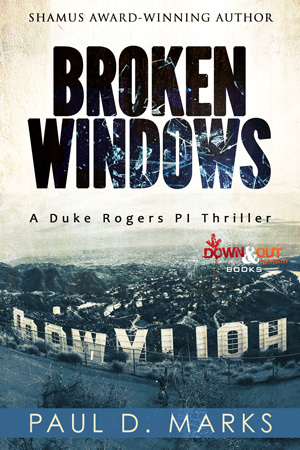 TAMPA, Fla. - May 3, 2018 - PRLog -- Down & Out Books is pleased to announce that BROKEN WINDOWS, a Duke Rogers PI Thriller by Paul D. Marks, will be published on September 10, 2018 in trade paperback and ebook formats. While the storm rages over California's notorious anti-illegal alien Proposition 187, a young woman climbs to the top of the famous Hollywood sign—and jumps to her death. An undocumented day laborer is murdered. And a disbarred and desperate lawyer in Venice Beach places an ad in a local paper that says: "Will Do Anything For Money." Private investigator Duke Rogers takes on the case of Carlos, the murdered day-laborer, as a favor to his sister Marisol, the housekeeper down the street from Duke's house. Duke must figure out what ties together Carlos' murder, the ex-lawyer's desperate ad and the woman jumping from the sign. He and his very unPC sidekick Jack are on the case. Their mission catapults them through a labyrinth of murder, intrigue and corruption of church and state that hovers around the immigration debate in this searing sequel to the explosive Shamus Award-winning novel White Heat. Paul D. Marks has written three novels, co-edited two anthologies and written countless short stories. He's won a Shamus Award, was voted #1 in Ellery Queen Mystery Magazine's 2016 Reader's Choice Award and been nominated for Anthony, Macavity and Derringer Awards. His story "Windward" was chosen for The Best American Mysteries of 2018. His short fiction has been published in Ellery Queen Mystery Magazine, Akashic's Noir series (St. Louis), Alfred Hitchcock Mystery Magazine, Crimestalker Casebook, Hardluck Stories, Hardboiled, and many others. Paul has served on the boards of the Los Angeles chapters of Sisters in Crime and Mystery Writers of America.